The plan was to start this technique article series by looking at how to use the various types of foothold. However you can study footwork all you like, but if you have the wrong shoes you can never hope to get the most from your feet. Forget the mentality that you're not a good climber so you don't need good shoes. It may be the case that you don't climb hard because of your lousy footwear! Poor shoes will ingrain bad habits, limit your repertoire and cause you to rely heavily on your arms. That said, good shoes won't guarantee success either, they will just help to maximize your chances. The most important thing is to buy shoes that fit and which suit the stage of progression you have reached. 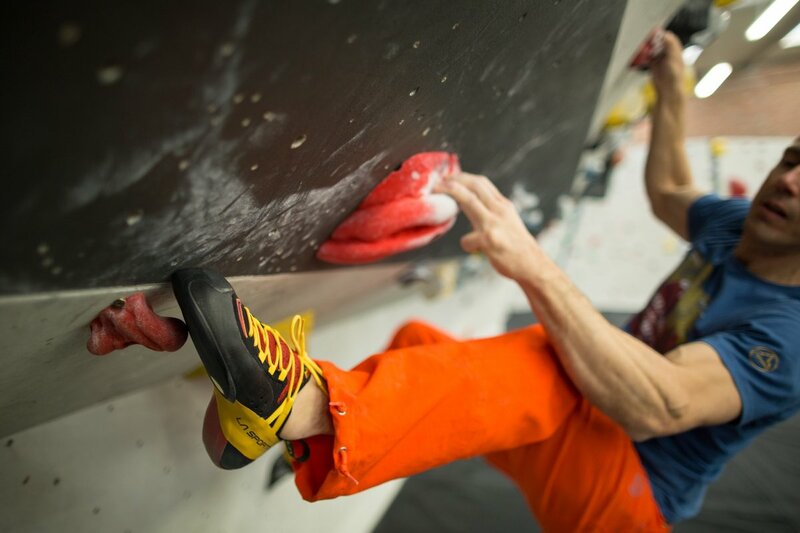 Performance rock shoes are designed to place the foot in the correct biomechanical position for climbing. They come in many guises but all will feature high levels of rand tension, arch support, and a pointed toe-profile. You can forget using tiny, sloping screw-on footholds unless you wear tight-fitting performance shoes. For this article, I have consulted the services of Dominic Sutcliffe who is the proprietor of Rock On, a small chain of specialist wall-based climbing stores. Dominic has over a quarter of a century of experience in fitting climbing shoes and it would be selling him short to say that he is passionate in this field, and more accurate to describe him as an obsessive. His comments are initialed 'DS'. This is not a comprehensive guide to shoe selection but the minimum advice to ensure that you can capitalise on the tips that follow later in the series. The advice is aimed predominantly at those who are looking to progress onwards from their first few pairs of shoes. First, for the purpose of study we will classify shoes into three categories, however, clearly some shoes will fall in the overlap between these categories. 'Flat, low tension, shoes with rounded toes'. These shoes are widely recommended for beginners because they are comfortable and provide reasonable overall support. 'Flat performance shoes': These are flat-soled shoes with a pointed toe-profile, arch support and a tensioned rand (the purpose of which is to force the toes into the front of the shoe). They may also be very slightly down-turned in the toe area. 'Down-turned performance shoes': These shoes are aggressively curved and down-turned at the toe and will feature high levels of rand tension and very pronounced arches. The thrust of this article is performance – if you are not interested in improving then there is no reason why you shouldn't size your shoes generously, for pure comfort. However, if you want to climb harder then rock shoes should be sized like ballet shoes rather than outdoor shoes. The shoe should feel like it's compressing your foot all over, especially in the toe area, but it should not feel painful. If you can keep them on for an entire session without feeling the slightest need to take them off then they're almost certainly too big and will not allow you to stand on smaller footholds. Conversely, if you can only tolerate them for less than a minute then clearly they're too small. If you feel the need to rest your feet every ten or fifteen minutes then they should be ideal for bouldering and sport climbing. Note that many shoes will stretch up to half a size and that this should be factored in when you size them (ie: if deciding between two sizes then go for the smaller size). There are no precise rules about how many sizes down you should go in relation to your street shoes. Forget what size you 'think' you should be and just go for what feels right. If you size shoes too generously for training purposes then you won't be able to use smaller footholds and may develop bad footwork habits. Be wary of the notion of having a tight pair of shoes for performance and a comfy pair for training, as the bigger pair could teach you bad habits when training and you may be more likely to get injured as the result of a sudden foot-slip. It will also take you time to adapt to the tighter shoes when you go outside and essentially 'remember' that you can stand on smaller footholds. The big challenge is to find the acceptable level of 'bearable' discomfort. Some climbers expect comfort, and many more expect PAIN, whereas the answer should lie somewhere in the middle. How confident are you going to be committing yourself to small or poor holds if you are in tangible pain? A tenet of shoe fitting is that the shoe that gives you the most confidence will help you the most. Learning to trust one's feet means trusting one's shoes. When considering fit, there shouldn't be any pressure points or areas of dead space, especially in the toes, but also in the heels. Look at width, volume (height of the forefoot) and the length of your toes relative to each other. Fit is not necessarily about finding a shoe shape that is identical to your foot but about finding a shape that your foot will sensibly fit into. The vast majority of modern performance shoes are asymmetric in shape (noted by the point of the toe being skewed over towards the big toe). This is because the big toe provides all the power when climbing. If your big toe or first two toes are longest then an asymmetric shape will feel like it's made for you, as not only will it fit well, but it will give the best performance. However, if you have a short big toe and longer middle toes (known as 'Morton's toe) then you are more likely to struggle and find that you have fewer options with performance shoes. In this case try to track down the 'least asymmetric' performance shoes (when you examine the soles you'll see that with some, the inside edge will angle inwards slightly and the point of the toe may be slightly more central). It may also make sense to go for flatter performance shoes, as one thing is having your toes forced to one side, and another is if they are being forced aggressively downwards as well. Similarly, if your feet are either excessively narrow or low-arched, then down-turned shoes are unlikely to work for you, and in which case, don't feel that a flatter performance shoe is an inferior option. Laces may also be superior to Velcro, to enable you to crank the shoes right up and fine-tune the fit. How curled should your toes be? A common question is whether or not your toes need to curl downwards and if so, how far. Clearly, this has bearing on sizing as well as the fit and the type of shoe. With down-turned shoes, the toes will need to be curling downwards more significantly than with flat performance shoes. A down-turned shoe relies on tension in order to provide support, so if you size them like carpet slippers they simply won't work. A flatter shoe works more as a passive platform and is, to an extent, more self-supporting; however, your toes will be way stronger if they curl slightly downwards, whereas if they are flat they will simply bend upwards under load. After all, our fingers are curled when we climb, so we should expect the same for our toes. Some climbers have less flexible toe joints and their feet simply do not bend well, and in these cases, aggressive down-turned shoes cannot be an option. Within the category of flat performance shoes, the degree of toe bend can vary dramatically, so it's important to try on many different models to find the one that fits the profile of your foot. A further consideration is the length of your toes in relation to the overall length of your foot (and hence the corresponding size of the shoe) as this will also affect how bent-down the toes are and thus how sharp an angle the joints adopt. For example, if you have very long toes and the shoes are forcing them to bend into a short toe-box then this will be painful and detrimental to performance. Choosing a climbing shoe can be difficult, in the first of a series of 4 videos La Sportiva's shoe design guru Pietro Dal Pra takes a look at some of the factors you should consider. Flat, low-tension shoes with rounded toes serve a vital purpose, providing a definite step up the performance ladder from everyday shoes and enabling beginners to get a feel of what climbing footwork is all about without breaking their feet or bank balance. They offer good durability and may represent the best choice for long multi-pitch routes, even for those who climb pretty hard. However, for bouldering and sport climbing these shoes quickly become very limiting. The lack of rand tension combined with the thickness of the materials will mean that you can barely feel the surface you're standing on and you won't be able to place the toe with precision due to its rounded shape. Overall these shoes will simply feel clumsy and unresponsive compared to performance models. The view that climbers should serve a long apprenticeship in this type of shoe is now long out-dated. This is partly because modern climbing walls allow much faster progression than was possible a few decades ago and also because there are now so many performance shoes to choose from, which means that you are much more likely to find a pair that fit tightly without causing discomfort. For those who make rapid progress and have a balletic climbing style, it makes sense to try down-turned shoes sooner rather than later, provided they fit and are sized correctly. Having worn out your first pair of shoes, a common question is whether you should 'go big' with something that is aggressively down turned or settle for something flatter. There are no short answers here and it will clearly depend on foot-shape as well as the performance profile of the climber (this does not necessarily mean the grade they climb but their build and climbing style). Looking first at foot-shape, if you try on a pair of down-turned shoes and size them tightly and correctly and they feel great then, providing you intend to use them mainly for indoor climbing, there is no reason to hold back. You can expect to find it tough to edge on smaller holds but you'll build the toe strength along the way. However, if you put on down-turned shoes and they feel very weird or painful then this is probably a sign either that your feet are the wrong shape or that you're simply not ready, or both. Most climbers who make the jump to down-turned shoes too quickly will find that their feet will cramp up, they can't edge well and they generally have a torrid time. However, certain climbers, for example those with a lighter frame and a gymnastic and balletic style may find that they take to down-turned shoes immediately. If you've had a few pairs of flat performance shoes and especially if you're bouldering upwards of V4, then it may well be the time to give down-turned a try. And if so, it's worth bearing in mind that down-turned shoes take some getting used to and you may need to adjust your climbing style in order to dial into their advantages. As climbers get more 'into' climbing (particularly those bouldering indoors), media icons, advertising or peer 'advice' start to influence, and the perceived or expected advantages of the more aggressive shoes become more appealing. We have to encourage these climbers but we also need to temper that enthusiasm. Just because you have the latest super asymmetric, downturned shoe, this does not mean you will be able to cruise every V5 in your chosen centre, and equally just because you don't have them it doesn't mean you can't. At this point, we come back to fit. A well-fitting flat performance shoe will climb better than a badly fitting super downturned, aggressive, headline-grabbing new model. Overall, flat performance shoes are usually more bearable for people who are relatively new to climbing (perhaps on their second pair of shoes) and are an introduction to the advantages (and also disadvantages) of a downturned shoe. On overhangs a down-turned shoe enables you to 'claw' with your toes, to prevent your feet from popping off. The relative performance benefits of flat performance shoes and down-turned shoes will often come down to perception and the climbing style of individuals. Of course, the hooked toe-profile of down-turned shoes will lend itself to pulling in with your feet on overhangs, whereas a flatter, stiffer platform will lend itself to edging, especially on longer routes. However, there are many micro-variations, which we'll cover when we examine footwork in subsequent articles. For example, some believe that down-turned shoes won't work on slabs, whereas others find them to be the best choice because of the way they allow you to get weight over onto the holds when making high steps. Many believe that down-turned shoes with softer midsoles facilitate a more dynamic and 'free' climbing style, however there are plenty who would disagree! Ultimately, you will simply have to experiment and make up your own mind. Down-turned shoes can provide a great advantage for hooking your toes over footholds when stepping high on slabs, however they may lack support for longer routes. Modern rock shoes have evolved to embrace the technical nuances of heel-hooking and toe-hooking, with different heel-cup and toe-patch designs offering subtly different performance benefits. This is a big subject, which we will be examining in separate articles on these key techniques. Women should simply go for the shoe that feels right and not be influenced by whether a shoe is 'women's' or 'unisex'. Shoes with softer rubber and greater flexibility will make sense for all climbers who are lighter in weight. In many ways, rock shoes should simply be regarded as rock shoes and the only thing that matters is that you get shoes that fit and feel right. As such, all the advice in this article applies both to men and women. A woman should be encouraged to buy a so-called 'mens' or unisex shoe in preference to so-called 'women's shoes' if they feel better and similarly, men should buy 'women's shoes'. Different manufacturers will have a different take on the concept of women's shoes. Some offer a slimmer, low-volume fit but historically these shoes have not tended to be particularly performance orientated. Other manufacturers choose not to offer a specific 'women's fit' on the grounds that a great number of women have broad feet, just as many men have narrow feet. However, they differentiate women's shoes by using softer rubber and more flexible midsoles so that they are balanced for a lighter-framed climber. There is validity to both approaches but the good news is that women finally seem to have more options open to them when it comes to high-performance shoes. Juniors should seek out softer performance shoes with less tension and avoid aggressive down-turned shoes that are designed for adults. Hannah Toward gets it right on Free and Even Easier 7a+, Malham Cove. There is scope for an entire article on footwear selection for juniors, so we'll keep this to the point. Kids, can either start off in a pair of flat, low-tensioned shoes with rounded toes, as advised for adults or alternatively, the junior equivalent which are available in very small sizes and are generally softer and designed not to put any pressure on the growing foot. Then at all costs, when juniors make the jump to performance shoes they should never cram their feet into aggressively down-turned and highly tensioned shoes that are designed for adults. Of course, kids are heavily influenced by their heroes and they will want to wear down-turned shoes, yet the flipside is that these shoes won't work if you size them too big. The answer is to go for flatter performance shoes, to pay scrupulous attention to fit and to size them slightly bigger than you would for an adult. Alternatively down-turned shoes exist, which are softer, less tensioned and have been designed specifically for the young foot. Much hype and hearsay surrounds the subject of rubber, with some climbers believing that certain brands are significantly better. If this were the case then elite climbers would surely re-sole with that brand; however, this isn't a trend that we see. The reality is that the main reputable shoe manufacturers all use very high-spec rubbers and the differences between them are barely noticeable. Of far greater note are the differences between the softer and harder rubber compounds that are commonly used. Softer rubbers may be perceived as 'stickier' (in the most commonly understood definition of the term) and they generally work better for smearing, whereas harder rubbers may perform better for edging, especially for heavier climbers. The sensation of climbing with both types of rubber is subtly different - harder rubbers tend to 'creep' less, meaning that they may feel more secure until the point when they suddenly blow, whereas softer rubbers may creep slightly and thus give a warning shot before they yield. Note also that softer rubbers are more prone to sheering when it's very hot, whereas hard rubbers may feel a bit stiff and clunky when it's very cold. For most of us the differences in fit will make more difference to us than the small differences between the rubbers. Having said all this, having confidence in your rubber is supremely important so remember as you press down on that tiny bump or crystal, that the rubber on your shoes actually is the best! Having found the ideal model and size of shoe, it's tempting just to stick with them forever, but rock shoes evolve and it pays to be receptive to new technologies. Rock shoe demos are fun and sociable events, which provide a good opportunity to compare shoes on the wall. Another small consideration is manufacturing consistency, as some shoes will vary in production and climbers occasionally come unstuck when the same shoe fits or performs differently. As such it pays to visit your local retailer to try shoes before you buy them, even if you are replacing like-for-like. Of course, in counter to the whole argument of having tight-fitting performance shoes we will always be able to sight examples of climbers such as the 'Bleausards' (the elderly locals in Fontainebleau who can cruise 7s in shoes that fit like carpet slippers) but this simply begs the question of how much harder they would climb if they wore decent shoes! Rock shoes are not shoes. They are tools to help you do a job - to make it easier to use your feet when climbing. The shoe that helps you is the right one for you. It may not be the one that helps Adam Ondra, Chris Sharma or any other amazing climber, but their feet are not your feet. Neil Gresham is widely regarded as one of the world's leading voices in performance coaching for climbing. He has been coaching and writing regular training articles for national magazines since 1993 and has pioneered many of the methods that are used widely by coaches today. Neil is the current training columnist for UKClimbing.com and Rock & Ice in the USA. He has climbed E10 trad, WI 7 on ice and in 2016 he climbed his first 8c+ at the age of 45 when he made the first ascent of Sabotage 8c+ at Malham Cove. Neil puts all his successes down to hard work, motivation and refinement of his game. He believes that work and family commitments don't need to limit our climbing goals provided we are focused and make the best possible use of our training time. All programmes are based on response to a detailed questionnaire and are aimed at the ability level, weaknesses, strengths, goals and lifestyle constraints of each individual. Programmes can also be based on the results of optional benchmarking tests. See 'benchmarking' on this site. Programmes can be for all-round performance or geared towards different climbing styles: bouldering, sport, trad or competitions. They can also be targeted towards goals, weaknesses, trips or projects. You can choose between a full training programme (which includes all aspects of training) or a 'fingerboard-only' training programmes. Fingerboard programmes include advice on how to fit the sessions in with other climbing and training.